The Seattle embarkation port for Alaska cruises that head north in many ways is just as good as Vancouver. 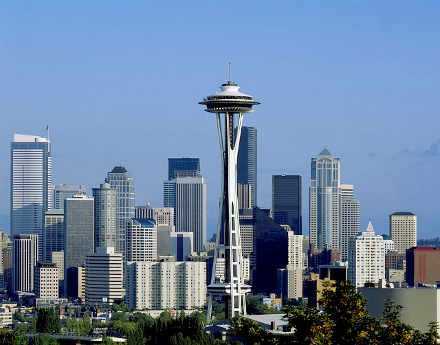 Like Vancouver, Seattle is a beautiful Pacific coast city with many attractions on land and on water. Cruise passengers who begin or end their journey in Seattle can spend at least several days there to take advantage of everything the city offers. Some travelers may not think that Seattle or Vancouver are really part of an Alaska cruise. But they really do offer many ways to make an Alaska cruise vacation more memorable. People who have a morning and afternoon before their cruise ship leaves can take advantage of two clusters of attractions within walking distance of the cruise piers. Anyone who spends an extra day in the city can venture out of it for plenty of hiking and other recreational activities in the surrounding forests and national parks. Seattle makes it easy for cruise travelers to find attractions. They pack a lot of them in one location less than one mile from the Bell Street Pier Cruise Terminal. They are easy to find because they surround Seattle’s most famous attraction, the Space Needle, built during the 1962 World’s Fair. It stands in the middle of a 72-acre complex named Seattle Center. The recent addition at the Space Needle of an open-air deck has revitalized tourism for this 520-foot-tall landmark. It has a rotating glass floor and great views of the city and surrounding Pacific Northwest. One tip: Try to go during a weekday and not during the crowded lunch and dinner hours. Other attractions right by the Needle in Seattle Center include the Pacific Science Center, Chihuly Garden and Glass, Museum of Pop Culture and the International Fountain. Pacific Science Center, 200 Second Avenue North, attracts more than 1 million people each year to its interactive science exhibits. The center also has a planetarium, IMAX theater and laser dome. Chihuly Garden and Glass, 305 Harrison Street, is a museum dedicated to the work of the famed glass artist Dale Chihuly. It features a glass garden, the Glasshouse and the exhibits. Museum of Pop Culture The Museum of Pop Culture focuses on “ideas and risk-taking that fuel contemporary popular culture”. An example is a recent exhibit of Marvel super heroes. The International Fountain in the middle of the Seattle Center park is an outdoor water sculpture with more than 20 spouts. The spout actions are coordinated with recorded music. The pier also is an easy walk to another cluster of attractions south of it at the Pike Place Market, Seattle Aquarium, Great Wheel and Seattle Art Museum. All four of these attractions are within several blocks of each other. Visitors can see one or all four within a few hours and still have time to go back to the ship before it begins the cruise. Three fourths of a mile southeast of the cruise docks is the famous Pike Place Market, 1514 Pike Place. Formerly a fish market, it is now a sprawling food, craft and shopping center in an old building. And yes, it still has fish and a unique charm. Several more blocks south of the Market, and right on the waterfront at Pier 59, is the Seattle Aquarium, 1483 Alaskan Way. The aquarium has a wide variety of marine life and marine exhibits. Anyone who visits the Aquarium can look south past the quiet Waterfront Park and see the Great Wheel at Pier 57. This giant Ferris wheel “is the largest observation wheel on the west coast” at 175 feet tall, according to its website. Several blocks directly east of the Aquarium is Seattle Art Museum, 100 University Street. It has 25,000 works of art from around the world that date from antiquity to the present day. Again like Vancouver, Seattle has both a reputable bus system and light rail system. The easiest and more expensive way to go from Sea-Tac Airport to the cruise terminal is with one of the shuttle operators who go between the two locations. One shuttle operator quoted $44 per person for a round-trip package between the airport and the pier. An online search with the term “shuttle service from seatac to cruise terminal” provides some operators to contact. The Sound Transit Link light rail makes 14 stops between Angle Lake Station to the University of Washington. Stops include downtown and Sea-Tac Airport. Trains arrive every six to 15 minutes depending on the day of the week, according to Visit Seattle. One way adult fares range between $2.25 and $3.25. Stops include Westlake Center, which is a little less than one mile from the Bell Street Pier Cruise Terminal. Walkers can make it in less than 15 minutes; otherwise, hail a cab at Westlake Center. Seattle famously is known as a rainy city, but it’s not really that rainy. It often just sprinkles or mists quite a bit throughout the year. Even November, the rainiest month of the year, averages less than seven inches of rain. More importantly for Alaska cruise travelers, the average rainfall from June through August is less than an inch a month. In May and September, the beginning and end of the Alaska cruise season, total rainfall is only a little more than one inch. So travelers are highly likely to find clear skies on most days of the week. The average daytime temperature during the summer is in the mid 70s Fahrenheit. Although Seattle has a few nearby beaches, it’s not a place to go for sand and surf. Instead, the weather is better for exploring the city and countryside.